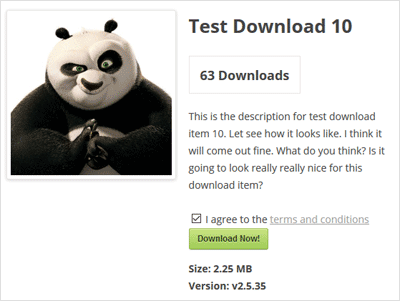 The Simple Download Monitor plugin gives you the ability to add a Terms and Conditions page to your downloadable items. 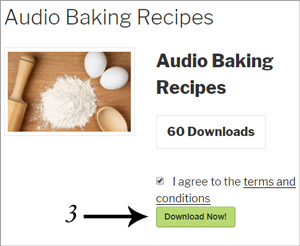 Once you have enabled this feature, your customers can read your terms and conditions prior to marking the I agree checkbox. A customer will not be able to proceed to download the item until they have agreed to your terms and conditions. As admin, you can outline your conditions on any WordPress post or page, or alternatively link to an external URL that states your T&C’s. In the example below, the customer has marked the checkbox to agree to the terms and conditions. Now he can continue to download the item. Below is an example of a basic terms and conditions page. This is simply a WordPress page with text and an image. Step 1) Click on Settings under the Downloads menu. Step 2) Once you are in the general settings of the SDM plugin, click on the Advanced Settings tab. Step 3) You will now see a section titled Terms and Conditions. 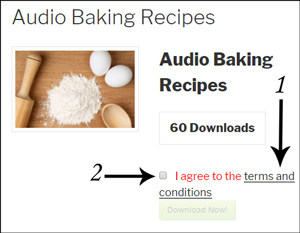 Step 4) To enable terms and conditions for your downloadable items, mark the checkbox next to Enable Terms and Conditions. Step 5) Enter the URL of your terms and conditions page in the ‘Terms Page URL’ field. This can be an internal or external page. Step 6) Ensure you Save Changes. After a customer decides on an item that they would like to download, they can simply view your conditions by clicking on the ‘Terms and Conditions‘ link found above a ‘Download Now‘ button. After reading the information about your ‘Terms and Conditions‘ your customer will need to mark the checkbox. After the checkbox is marked, the customer will have the ability to click the ‘Download Now‘ button. Your customer will read the terms and conditions and then will mark the checkbox to agree to them. After marking the checkbox they will be able to download the item.